FILE - In this June 25, 1952 file photo, a fire tug fights flames on the Cuyahoga River near downtown Cleveland. 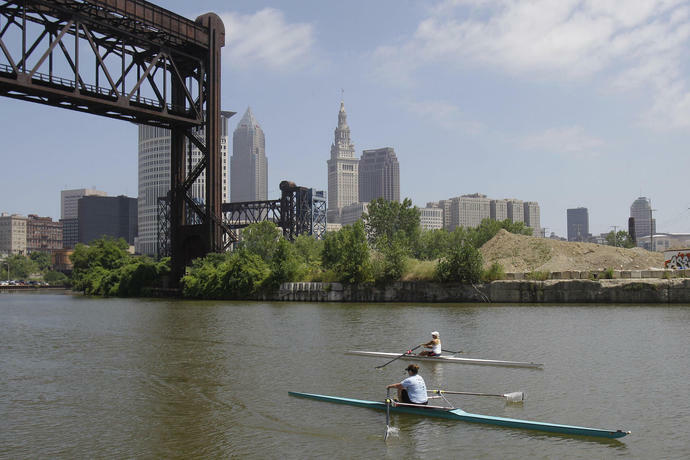 FILE - In this July 12, 2011, file photo, two rowers paddle along the Cuyahoga River in Cleveland. COLUMBUS, Ohio (AP) - Fish in the Cuyahoga River, which became synonymous with pollution when it caught fire in Cleveland in 1969, are now safe to eat, federal environmental regulators say. The easing of fish consumption restrictions on the Cuyahoga was lauded Monday by Republican Gov. Mike DeWine as an important step toward ultimately delisting the river altogether as an area of concern. Seven impairments remain to be addressed before that can happen. "This is an example of the progress that can be achieved when you collaborate and dedicate resources to improving the quality of water in our state," DeWine said in a statement. "We need to continue to invest in our water resources so that we can see additional improvements." The announcement came as DeWine is pushing a state budget that includes nearly $1 billion for water quality projects aimed at cleaning up toxic algae in Lake Erie and protecting other lakes and rivers in the state. 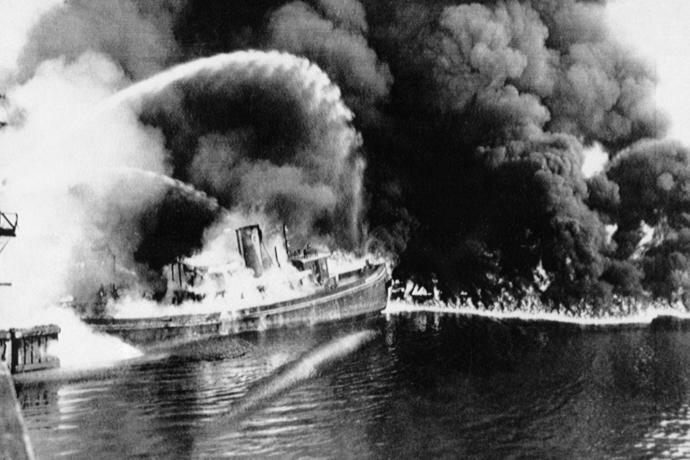 The Cuyahoga River was already one of the most polluted rivers in the country at the time of the fire on June 22, 1969, close to where the river empties into Lake Erie, according to the Ohio History Connection. The fire was neither the first nor the worst the river had experienced. But the 1969 fire on the river, where industrial waste and sewage were regularly dumped, drew national media attention that made it an instant poster child for water pollution at a time when the country was becoming more environmentally aware. "As we approach the 50th anniversary of the most infamous Cuyahoga River fire, we reflect on the progress that has been made," said Kyle Dreyfuss-Wells, CEO of the Northeast Ohio Regional Sewer District. The U.S. Environmental Protection Agency, whose creation was inspired by the Cuyahoga River fire, gave the thumbs-up to easing the fish consumption restrictions. Regional administrator Cathy Stepp called it "a huge step" in the agency's work to improve water quality. The U.S. EPA agreed with Ohio EPA's recommendation that restrictions on fish consumption be eased from Gorge Dam near Akron to Lake Erie in Cleveland. State regulators proposed the change last year judging by improvements observed through fish tissue sampling. Ohio EPA Director Laurie Stevenson said in a statement, "If you safely can eat the fish, we know that's a great indication that water quality is improving."